Website change monitoring software keeps track of a website on regular intervals. It stays in a tray or in the background as a service. When the website content is changed even by single pixel or character content, it reports that on desktop. The apps are designed in such way that it can keep track of child pages within website, or RSS feeds and even the comment section of the website. Reporting can be done on website or even by sending you an email. Depending on how you make notification settings the apps should notify you when the website is changed. Here are some of the apps that you can use on Windows operating system to track website changes. This is one of the powerful app that allows you to keep track of website changes. The app is a bit expensive compared to other software, also it costs a lot in currency conversion from British pounds. However the features offered by the app are very advanced compared to any other app in the market. It offers you to save local copy of the website. It can also be used in automated mode to run the program. Apart from website, it can be used to keep track of FTP and RSS feeds. You can also bookmark the websites and feeds. The program then can be programmed to take the feeds from the bookmark. In short, this is one stop solution for all the website change monitoring requirements. Copernic is known for their products related to indexing the desktop and web. Tracker is one of the app that allows the user to keep track of the website changes. 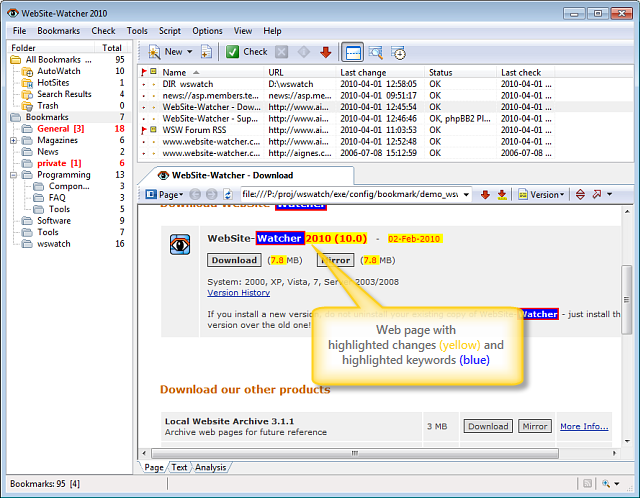 Like website watcher, it can be used to keep track of the RSS feeds and FTP too. Recently Copernic stopped actively developing the program. However it can be downloaded and used on Windows 10. It works on the recent version of Windows without any issues at all. However there is no support being offered anymore. So in case of issues, you just have to install the program again and see if that solves the issue. Keeping that issue aside, the program is very impressive and can be helpful for those who wish to keep track of website changes. This is not exactly desktop app but more of a Webapp. It can be accessed from any browser. The website asks you to open an account on their website. You can then put in the website for tracking the changes. If your website gets updated in very short term interval then it'd be wise to upgrade to paid version. The current paid subscription is based on the donation. So if your use of this functionality to notify the customers of any change in specific region of your website, then you can use notification mechanism of this site. Site also sends an email if you have set such notification option in your account. If you want support then you should donate to the services and then get some priority over your issues. The website has friendly support system and can be used in both free and paid accounts for the website monitoring tasks. Another webapp that allows you to keep track of website changes. It has both free and paid plans with more advanced features. If your work involves around casual tracking of webpages then surely you can find this service useful. It has one bookmark feature, where you can surf normally and then click on the bookmark link. Clicking on that link will create one task in their servers. And it'll ask you to login to the website. Once the task gets registered to the account on their server, you can get notification. If you are paid user then you can also use their API to notify your customers of website changes and updates. Like Trackengine this service is web based too. It makes use of API system to allow you to get notification on service of your choice. Like most of the services, the app allows free version to be used on small scale basis. If your monitoring usage is minimal then you can use free plan. However if you want the updates on daily basis then you should upgrade. It also has API method which you can use to develop your own notification system. That can later be used to notify your customers. It is one of the simple to use app out there for website change monitoring. For casual usage you may not need to upgrade to paid plan, however casual usage has limited functions which makes you upgrade to pro plan eventually. When you are keeping track of website for price change or share prices etc then such apps can be really helpful. The above list is far from complete and there are many other apps available for Windows Platform. You can make use of online webapps mentioned above if you can't spend money for casual usage of the service.